This retreat is ideal for those of you with little to no surfing experience. Mondo Resorts surf coaches will select wave locations appropriate for the individual or group according to experience. Mondo will work with intermediate level surfers on correcting details and postures so you can move to the big leagues! 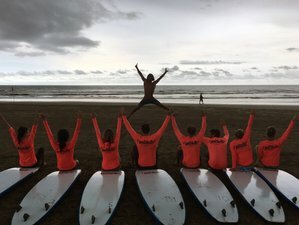 The goal is for each student to progress to the next surfing level. Morning yoga session starts at 07:15 a.m. until 08:30 a.m. followed by out tasty breakfast options. After a day of surfing, Muay Thai, and adventure come chill out with a relaxing afternoon yoga session. This restorative class combines long-held Yin stretches with graceful slow flows and transitions, specifically targeting the muscles used while surfing. All poses are done from the floor (no standing postures), making this a relaxing, meditative class, perfect for increasing flexibility in a passive, restful way. The yoga session starts at 17:15 until 18:30. During this retreat, you can choose for once or twice daily yoga session morning or afternoon.